Andrew Lloyd Webber’s West End production of School of Rock The Musical at the New London Theatre. Based on the smash hit 2003 film of the same title, School of Rock features music from the movie, as well as new music written by Andrew Lloyd Webber and lyricist Glenn Slater and a book by Julian Fellowes. 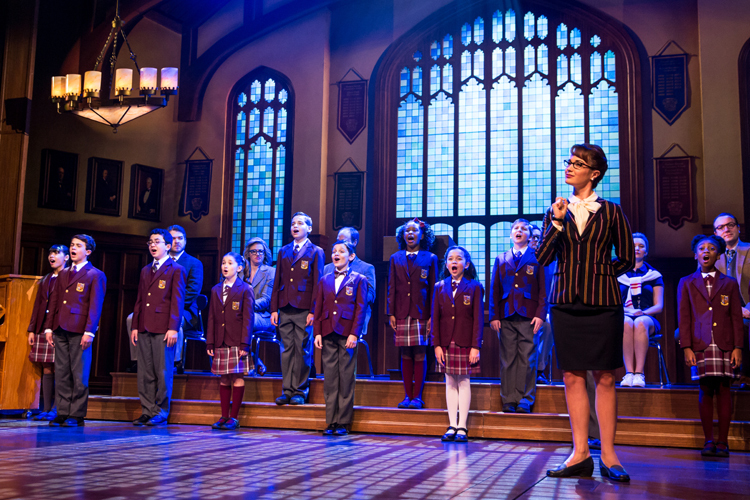 School of Rock – The Musical is directed by Laurence Connor with choreography by JoAnn M. Hunter, set and costume designs by Anna Louizos, lighting design by Natasha Katz, sound design by Mick Potter and music supervision by John Rigby. 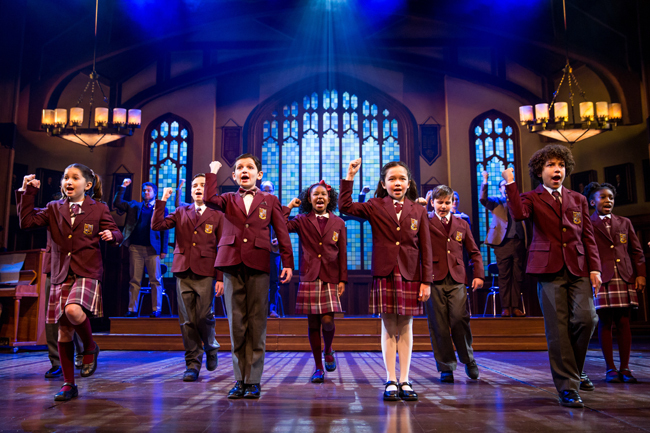 School of Rock –The Musical received its world premiere at the Winter Garden Theatre in November last year and has subsequently garnered 20 Broadway Theatre Awards nominations including four Tony nominations – Best Musical, Best Book of a Musical, Best Original Score and Best Performance by a Leading Actor in a Musical. At the Broadway opening guests included Mick Fleetwood and Stevie Nicks, Helen Mirren, Sting as well as the complete “kids” cast from the original School of Rock film. Earlier this month Jack Black who played the role of Dewey in the original film School of Rock, met with the US cast and declared the show “a Broadway masterpiece.” In October last year School of Rock – The Musical released a 360° music video, shot in a real NYC classroom and featuring the song You’re in the Band, that generated over 1 million views in three days on YouTube and Facebook combined, the fastest Broadway video ever to reach 1 million views. 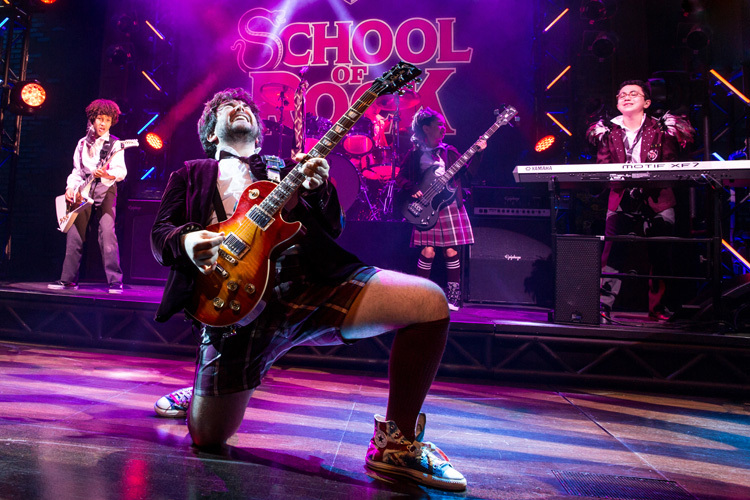 Over the 2015 holiday period School of Rock – The Musical twice broke the house record at the Winter Garden Theatre, previously home to Cats and Mamma Mia! In April Grammy Award-winning Fleetwood Mac singer Stevie Nicks made her Broadway debut at School of Rock – The Musical when she surprised the audience by taking to the stage and singing Rhiannon with the musical’s kid band. School of Rock – The Musical was the first original British musical ever to premiere on Broadway. 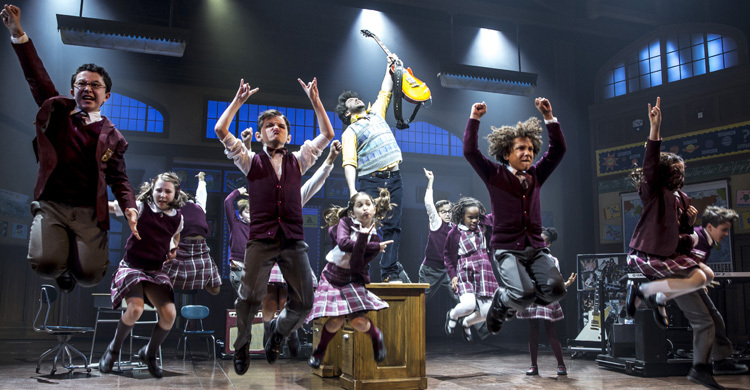 The Broadway opening was accompanied by another US first, when Andrew Lloyd Webber also launched a nationwide release of the rights for schools and youth groups to create their own productions of School of Rock – The Musical using the exact same score as the Broadway show. Here in the UK, plans are well advanced to replicate that success ensuring that schools, colleges and youth groups can look forward to being able to license School of Rock – The Musical very soon. The Broadway production of School of Rock – The Musical continues at the Winter Garden Theatre, currently booking to 5 February 2017 and a national Company will launch a US Tour in the Autumn of 2017, playing coast-to-coast engagements across America. Andrew Lloyd Webber is the composer of some of the world’s best-known musicals including Cats, Evita, Joseph and the Amazing Technicolor Dreamcoat, Jesus Christ Superstar, The Phantom of the Opera and Sunset Boulevard. School of Rock, a stage version of the movie, is his latest musical. His awards, both as composer and producer, include seven Tonys, seven Oliviers, a Golden Globe, an Oscar, the Praemium Imperiale, the Richard Rodgers Award for Excellence in Musical Theatre, a BASCA Fellowship, the Kennedy Center Honor and a Grammy for Best Contemporary Classical Composition for Requiem, his setting of the Latin Requiem mass which contains one of his best-known compositions, Pie Jesu. He owns seven London theatres including the Theatre Royal, Drury Lane, the New London Theatre and the London Palladium. He was knighted by Her Majesty The Queen in 1992 and created an honorary member of the House of Lords in 1997. He is passionate about the importance of music in education and the Andrew Lloyd Webber Foundation has become one of Britain’s leading charities supporting the arts and music. Read our 5-star The School of Rock Musical review. Book School of Rock Musical tickets for New London Theatre. Directions from nearest tube: (5mins) Go right on Long Acre; turn left at Drury Lane and you’ll see the theatre 100 metres away on a corner. Previous theatres on this site include the 1851 Middlesex Music Hall which was rebuilt by Frank Matcham in 1911 and subsequently renamed the Winter Garden in 1919. The theatre went dark in 1960 following which it was demolished in 1965. The present theatre was designed with a third of the stalls on a revolve while the walls were designed to be movable thus giving the New London Theatre an auditorium that was extremely adaptable. The modern New London theatre is built on a site of previous taverns and music hall theatres, where entertainment has been located since Elizabethan times. Nell Gwynn was associated with the tavern, which by the end of the 17th century became known as the Great Mogul, and presenting entertainment in an adjoining hall. In 1919, the theatre was bought by George Grossmith Jr and Edward Laurillard, the theatre was refurbished and reopened as the Winter Garden Theatre. The Vagabond King was produced in 1927, and in 1929 Fred and Adele Astaire starred in Funny Face. In 1930, Sophie Tucker played in the Vivian Ellis musical Follow a Star, and in 1923, Gracie Fields appeared Walk This Way. In 1933, the theatre hosted Lewis Casson in George Bernard Shaw’s On the Rocks, with Love on the Dole in 1935 starring Wendy Hiller. The theatre then closed in the late 1930s, and reopened in 1942. The theatre closed once more in 1959 when it was sold by the Rank Organisation to a property developer. It was completely gutted and remained vacant until 1965 and then replaced in 1973 by the current building. The New London Theatre was designed by Paul Tvrtkovic and seats 960 on two levels, the theatre’s auditorium first opened with a television recording of Marlene Dietrich’s one-woman show on November 23rd-24th, 1972. The theatre officially opened on 2nd January 1973 with The Unknown Soldier and His Wife starring Peter Ustinov. It then hosted Grease with Richard Gere as Danny. The theatre was then utilised as a television studio for several years and subsequently returned to be used as a theatre. The theatre’s biggest hit up to that time was Cats, the Andrew Lloyd Webber and Trevor Nunn musical, which premiered in the theatre on 11th May 1981 and run until closing in 2002. Between 2003 and 2005 Bill Kenwright’s revival of Andrew Lloyd Webber’s musical Joseph and the Amazing Technicolor Dreamcoat played. This closed after two and a half years on 3rd September 2005. More recently the venue played host to the London transfer of the off-Broadway production, Blue Man Group, which closed in June 2007, then followed the Royal Shakespeare Company’s repertory productions of The Seagull and King Lear, starring Ian McKellen. From Spring 2008, we had Gone With The Wind which played for a relatively short run. 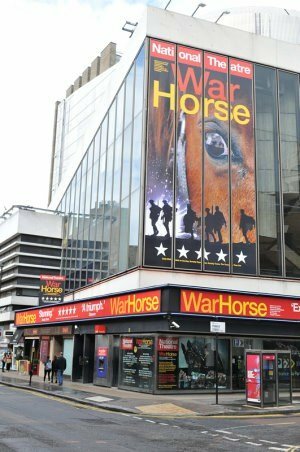 War Horse and Show Boat were most recently in residence.